Spring is here in Idaho. I am enjoying not having to run the heater in the shop. I will be making a big push to get more tampers in stock this week. I really do like doing custom orders. Up until now, I have been making custom tampers in good faith. That is making the tampers on a "hand shake" deal. However, I now have three very nice tampers that were made because of good faith on my part, and the person ordering the tamper never paid me. I will be putting those tampers on the website tonight or in the morning. So from now on, I will not be making custom orders unless I am paid first. I'm sorry a few bad apples have spoiled what I have enjoyed as a good faith business. 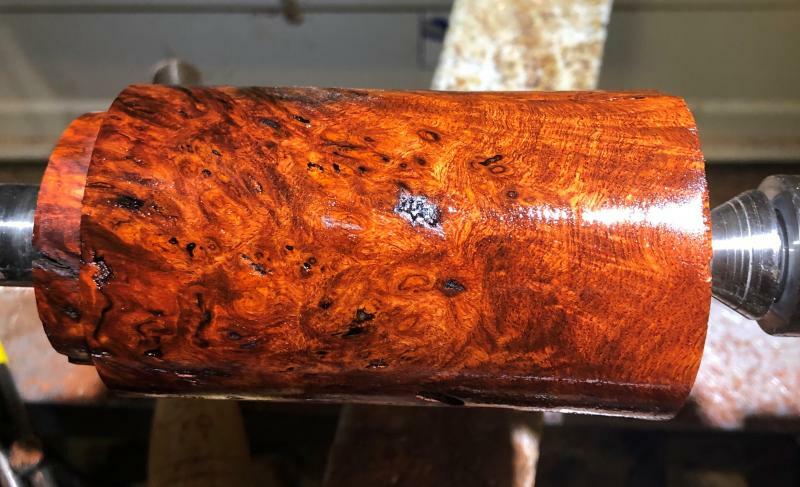 While cleaning up the shop I discovered some very nice exibition grade Myrtlewood. The tamper on the right is a very nice piece of Myrtlewood, exibition grade had awesome figure and much of it has a nice fiddleback. I am going to be making some tamper blanks from that wood today. Myrtlewood is a rare American Tropical Hardwood that only grows along the Southern Oregon and Northern California Coast. I lived in Myrtlewood country for over 20 years and got to know many of the Sawyers, and have a very nice supply of highly figured wood. It is the best valued tamper and handle material that I fhave. I often get asked, "What kind of tamper do you use? Right now my main tamper is made of Bubinga. This is a West African Hardwood. It is often miss called, African Rosewood. It has a rich reddish color. My other two tampers that get use often are made of Myrtlewood and good old Maple. Check out the tampers I have in inventory on the left. I am hoping to build my inventory again over the next few weeks. I am always open to discussing a custom made tamper as well. NOTE: The new LaSpaziale double baskets (they have writing on the side showing the capacity) are a smaller diameter than the older baskets! I am working on a compromise size that will fit both. I couldn't use my tamper fitted to the older basket on the new basket. If you have a 49mm machine, I have Elektra baskets. I have found them to be one of the best baskets for 49mm machines. I got these baskets at a good price and they are only $10.00. Pulling shots on several machines that I now own continues to help me improve my craft as a tamper maker. I also have had several 58mm machines in the past 20 years. I just don't have room for one in the kitchen. I still have one that I break out about every two weeks just to keep my skills up. I've talked about how much I like the LaSpaziale machines, but I have never owned one. Now that I have pulled well over 200 shots (it has a counter), I am not disappointed. I love my nice fitting Thor Tamper. I am using a Bubinga tamper for my own personal use. I was very tempted to pull the new Desert Ironwood tamper made for the LaSpaziale for my own personal use, but it has found a new home. I have a few custom orders to finish. I would love to work on a project for you. Send me an email and we can get started. I was going through my inventory, and found my last English Oak Burl Blank. This burl came from Notingham England. I also found two Red Resin Burl blanks. This wood comes from South Africa. It is very rare. I have put up some blanks that have been rough turned and wiped down with mineral spirits to show the color and grain. These are rare blanks that I would prefer to make custom tampers, rather than guessing what your machine requires. There are still some very nice tampers in my limited inventory. The tampers to the left are ones that I have put in inventory. They are listed by size. If you don't know what size you need, send me and email and I will help you out. I had a very nice stablized maple tamper for sale for a long time. When I added a new 58mm machine to my stable of machines, I "gave it to myself." So, if you don't see something you like, I love making custom tampers. They don't cost more, but it does take me a week to make one from start to final finish. I also do them in the order that I receive them. I am a small one person shop, making unique one of a kind tampers. Tampers listed on the left are for sale. The tampers on the right are featured tampers or new tampers that I have just completed. They are for sale. Every tamper I make is hand made and unique. If you see a tamper you like, email me. I sell on a first come first serve basis. Most of the time if something sells, I can make one that is very similar, or maybe even better! I do all of my transactions via PayPal. Paypal is safe and secure. You don't have to be a member, and it doesn't cost you anything. I will send and invoice, and you will pay with a debt or credit card.
. I am really upset that shipping rates to Europe and Canada have gone so high. It is an extra $40.00 to ship a tamper to Canada or Europe. I viewed a review of one of my older tampers with one of another brand on YouTube the other day. I thought it was a fair review, but it does not reflect my current practices. In the past, a 58mm tamper was turned to 58mm. I now size all of my tampers to actual portafilter baskets. They are not only checked with a micometer, but the are test fited to baskets before passing my quality tests. My goal is to make a functional piece of art that is better or at least as good as other tampers. I have had some conversation with Sal the author of that review. His website is educational, so I am putting a link to his website. Sal made corrections to his website, but his video has some errors. All of my tampers have a Lignum Vitae, the hardest wood in the world, or Corian. My standard weight is less than the tamper he reviewed. If you have any questions, please send me an email. If you don't see something you like, send me an email, and we can discuss options. I would love to make you a tamper that you will treasure. I am trying to keep at least 3 tampers of each size in stock, If you don't see a lot of new additions, it means I am busy making custom tampers. I am always open to discuss a custom tamper! This isn't the best website, but I would rather be making tampers than spending hours trying to make the ultimate website. Once I get an inventory built up, I will improve the website. Making tampers out of fine hardwoods is a passion of mine. The tamper is the human connection with the coffee just before pulling the shot! Some advantages of a Thor Tamper is the nice feel of wood in the hand. The lignium vitae or Corian base that I use does not stratch or dent your portafilter. My tampers are Core Weighted. The greatest amount of weight is over the middle of the tamper rather than on the perimeter like a steel tamper. This centers the tamp easier and gives you much more feel as you tamp. All Thor Tampers are core weighted. All of my tampers are made by me. I have had a number of Chinese companies contact me to outsource my tampers. I would never do that. I have about 50 species of wood in stock. My favorite hardwood is Myrtlewood. It is also known as California Laurl. It is America's only Rain Forest Hardwood. It has a warm color; lots of character; it is fine grained; it finishes well; and has good feel. It is a fairly rare wood that only grows along the northern California and southern Oregon coast. One of the tampers I personally use is from Myrtlewood. 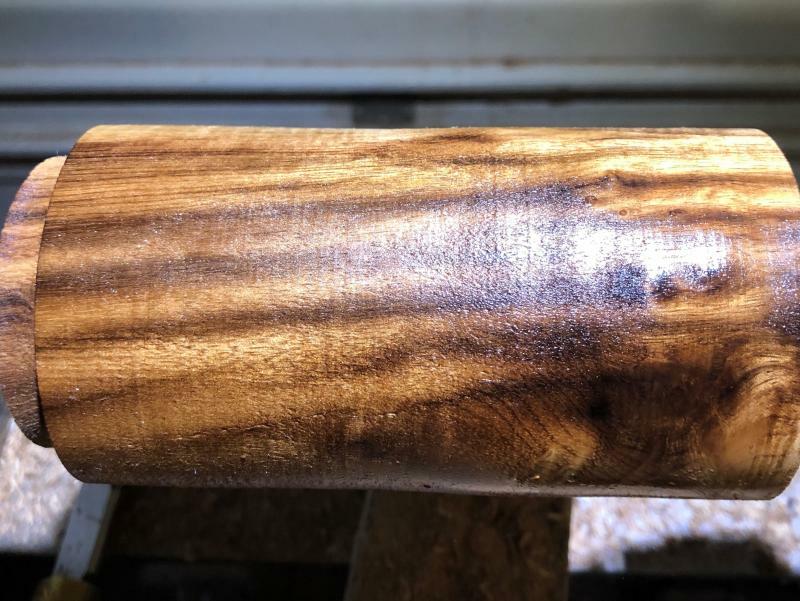 I have posted blanks over the last couple of months of some of the more special woods to be made into tampers. The reality is most of them where made into tampers that were not 58mm. It seems as if I usually turn these nice blanks into 58mm tampers as they are the most popular. So, I will be posting some of these from time to time so you can have a spectaclar tamper made for your specific machine. 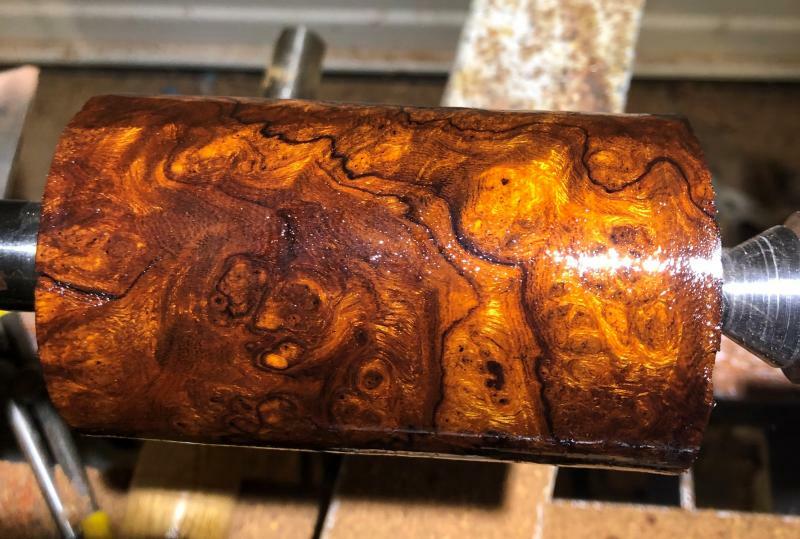 Desert Ironwood Burl Blank. I was amazed when I opened this blank up! This is one of the most beautiful blanks I have seen. It has awsome figure and color! It is so amazing, I may keep it for myself if nobody jumps on it soon. At $145.00 this is a bargin. It is impossible to get Desert Ironwood burl in 2 and a half inch thick pieces anymore. I have standing orders with three suppliers and haven't heard from them in 18 months even though I contact them about every three months. I can make this blank into any tamper from 58mm or smaller. Cost is $145.00 plus $2.00 shipping. Amboyna Burl Blank. This is a rare wood from Southeast Asia. I cut up the last burl I had, and I thought I was going to have a lot more available wood for tamper blanks. This may be the last one. I have checked with several suppliers and this wood is getting not only impossible to get, but very expensive as well. The cost of a tamper out of this blank is $90.00. Shipping is an additional $2.00. I'm looking forward to making someone a unique piece of functional art! I was going through one of my sheds and found some very highly figured Myrtlewood that I didn't know I had. This picture doesn't display the beauty of this wood as well as I would like. However, it is going to make an awesome Tamper. Since I got such a great deal on this wood the Cost of a tamper from this wood is $75.00 plus $2.00 shipping. The blank above has been sold. However I have several other blanks that are just as nice out of this wood, so more are available. This wood has it all, nice colors and chetoyance. "My new tamper is breathtaking." "The wood and craftsmanship are off the charts!" "Nice piece of work on the tamper. It works great." "It is a gorgeous piece of wood and work! Thank you!!!! "I love the tamper. Great fit compared to the one I had been using. This puppy is nice and tight." "I love the Ridgeline feature since it is a cinch to get a level tamp." "It is beautiful in both wood and craft. I am also pleasantly surprised how comfortable it fits my hand." " I have a much better feel for the tamp than with my other 4 tampers." "Got the tamper, just wanted to let you know that it's incredible." "Tamper arrived last week and espresso service has already improved." I received the new tamper today, and what a difference it makes! I love it!" "Just got the tamper, and I love it! My wife has already taken to calling it 'My Preeciousss.'" "My tamper is a work of art."